Laws have passed, protests were marched, and voices have been heard- but gun violence still persists. 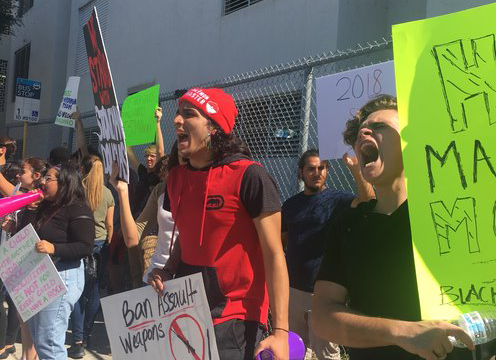 SouthBroward students outside the school, protesting the NRA after the MSD shooting last year. Just one day after the Marjory Stoneman Douglas shooting, MSD students Cameron Kasky and Alex Wind held a candlelight vigil in the Pine Trails Park amphitheater in Parkland, honoring and mourning the 17 lives that were taken the day before. Over the next three days, #NeverAgain gained thousands of followers on social media and the movement began to take form. February 17th saw the first gun control rally held in Fort Lauderdale, where students and teachers pleaded with lawmakers to make sure this doesn’t happen again. February 20th brought a rally organized by the Florida Coalition to Prevent Gun Violence and the League of Women Voters to support gun safety reform in Tallahassee. One hundred students made their way to the Capitol, and watched Florida legislators reject a bill that would ban assault weapons and high-capacity magazines in the state. Over 3,000 people protested in front of the Capitol the following day. The truest shift in the paradigm the nation has experienced was the March For Our Lives protest, on the streets of Washington, DC. Over 500,000 people marched down Pennsylvania Avenue, hand in hand with sister rallies taking place all over the world. Emma Gonzalez, David Hogg, Cameron Kasky, Alex Wind, and other MSD students led the charge and gave their speeches in front of a crowd of supporters. “It’s like we’re having kids learn to walk out during a fire instead of making the school less flammable,” David Hogg told the Bulldog Bark in regards to how schools and government officials are handling the issue of safety. “After we had the march, our thought process was, ‘Now that everybody knows what’s going on, how do we actually get them to do something and act on what they now understand and feel?’” Stoneman Douglas senior and March for Our Lives activist Alfonso Calderon told Rolling Stone. The day after the Parkland students’ graduation, the students of the March For Our Lives movement announced the Road to Change, a nationwide Summer activism tour, embarking on June 15th. Students returning to school in Florida and other states felt the shift when the various and many updates to school safety policy were put in effect, punctuated by Guerra’s uneasiness with her school’s decisions. “Our school is not an airport, it is not a jail, we cannot have metal detectors,” Guerra said. But action as loud as this can only bring reaction, and this was a year of unparalleled success for the gun-control movement in the United States. States across the country, including 14 with Republican governors, reacted to the shooting and subsequent thunderstorm of protests and activism by passing an unprecedented 50 new laws restricting access to guns, ranging from banning bump stocks to allowing authorities to temporarily disarm potentially violent people. One being the Marjory Stoneman Douglas High School Public Safety Act, passed by Florida Governor Rick Scott on March 9th. The act would strengthen background checks, change the minimum age to purchase a gun to 21, ban bump stocks, give law enforcement the ability to confiscate weapons from people deemed “at risk”- and most controversial of all, arm teachers with the consent of the school and local sheriff department. The decision to arm teachers was met with loud opposition by many students concerned with their own safety. The law that Hogg is “most proud of” is the law that Maryland passed last year, along with 13 other states. The law allows concerned family members and law enforcement to ask a judge to temporarily confiscate firearms from gun owners who pose a risk to themselves or others, as well as banning bump stocks and other rapid-fire accessories. 2018 began with a tragedy, and followed with a movement. One that isn’t near its own end. With school safety policies, bleed kits in every class, and school shooter simulation drills on the horizon, Hogg says their fight is far from over. Students across the nation are still scared and fearful, especially with the anniversary of the shooting approaching. But with 2018 being such an unprecedented year for gun safety laws and bills, students and alumni that align with the movement, like Guerra and Hogg, look towards 2019 with an air of hope. It is horrifying that we must go through this, we must find some solution to end these acts of violence in America. Currently I have not seen any solutions that would work to prevent something like this from happening; however, I am open to discussing the issue. Would you be open to a discussion on the best ways to solve the issue?